FLORENCE, Italy — On one fine day in early fall, Filippo Ricci, creative director of the luxury company started by and named for his father, Stefano, proudly opened the heavy iron gates to an old silk mill in the center of Florence. Visitors crossed a stone courtyard shaded with orange and banana trees, strawberry and wild grape vines, their bounty waiting to be turned into jam by the mill’s workers. “It’s like taking a step into the past,” Mr. Ricci said as he moved past a door painted red, the signature of Florence’s age-old silk guild, to enter a large loft-like space built of rustic wood and brick. 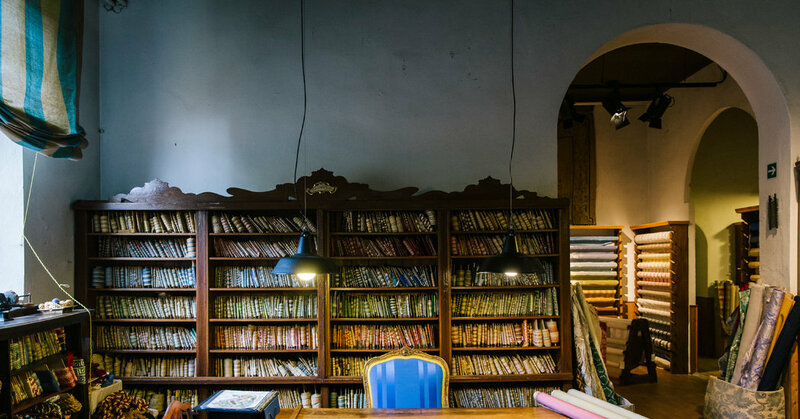 For hundreds of years weavers have been at work here in the Antico Setificio Fiorentino, creating the sumptuous fabrics for which the city is known. “It’s like a little undiscovered jewel,” Mr. Ricci said, but open to the public by appointment. And its heart has to be a warper machine designed by Leonardo da Vinci and built in 1786. It is still in use today because it, quite simply, does the job and does it well. Silk has been made in the city since at least the 1300s, a commodity for trade. Anyone who ever took Art History 101 will be instantly familiar with the mill’s creations: They envelop the noblewomen in canvases by Piero della Francesca, Pontormo and Masolino. The carmine red curtains at the Villa Medici in Rome and the Tribuna of the Uffizi in Florence were made here. The Presidential Suite at the Four Seasons Hotel in Florence is decked in the mill’s output, as are the walls of the czars’ throne room at the Kremlin. He stopped at a work bench to illustrate: Using metal plugs and a mallet, he punched a random series of holes into a flat sheet of thin metal, called a card. Cards are used to direct the loom — it can take as many as 2,000 to produce a little more than five feet of the woven patterned fabric called jacquard. Six of the mill’s hand looms, once owned by noble families in the city, date from the 1700s; each can produce only a little more than 15 inches of fabric a day. In 1786, the looms were gathered in one space in Via de’ Tessitori (Weavers Street). There also are six semi-mechanical looms from the 1800s, each of which, in contrast, can produce almost 33 feet of fabric a day. The mill won’t use any more modern machinery: “They work too fast and would break the threads,” Mr. Ricci said. Older can be better, as Leonardo’s machine proves. It looks a bit like a carousel, several feet in circumference, except instead of wooden horses and swans spinning around, there are the warp threads, the long threads that extend the length of a piece of fabric (the weft runs the width). “The warping machine moves vertically, allowing the worker to prepare a quantity of thread” but in a small room, Mr. Ricci said. Before Leonardo designed the vertical warping machine, sometime between 1490 and 1505, the warp threads were handled flat, requiring a space at least 165 feet long. The city of Florence claims the Renaissance genius, born just outside the city, as a native son. Leonardo died in 1519 in Amboise, France, but in its desire to be the first to mark the 500th anniversary of his death, Florence has already begun its observances. On Oct. 30 the Uffizi Gallery introduced an exhibition of his sketches and drawings, including the Codex Leicester, on loan from Bill Gates (until Jan. 20). Other museums in the city are devoted to displays of Leonardo’s remarkable range of inventions, from a flying machine to a machine gun. Weaving is physically demanding, and the weavers at the Antico Setificio Fiorentino are invariably women. “In the past 30 years we’ve had only two men,” Mr. Ricci said. “Mothers and daughters come here from weaving schools and are trained for six months. It’s the only way to keep the skill alive,” he said. Working the loom is a full-body activity. The weaver’s legs work the calcola, or pedal, to throw the lancia navetta, or shuttle, back and forth at such speed that it is barely visible, while their arms pull the heavy wood cassa battente to press the weft together. “It’s like listening to a beautiful orchestra,” Mr. Ricci said, although the weavers might think otherwise — the sound is so loud they wear earplugs. And they are priced accordingly, starting about 200 euros a meter, or about $102.85 per foot, and increasing to as much as €2,000 a meter for lampasso, a special kind of damask so labor intensive that less than eight inches can be made in a day. Even at those prices, Mr. Ricci said, the mill represents less than 1 percent of Stefano Ricci’s business. “We do it for love,” he said. The mill has been attracting the attention of today’s innovators and inventors, too. Jeff Bezos has paid a visit, and Tim Cook has expressed an interest as well. And everyone there expects that very soon one of Leonardo’s biggest fans, Mr. Gates, will want to see one of his hero’s creations at work.